keeping the increase in global average temperature to well below 2°C above pre-industrial levels [and] to aim to limit the increase to 1.5°C. Many people argue that such target are purely political. Of course, a decision to try and achieve some goal will always be political, but that doesn’t mean that one can’t find some kind of justification for that choice of target. On that note, I recently came across a paper by Hans Joachim Schellnhuber, Stefan Rahmstorf and Ricarda Winkelmann called Why the right climate target was agreed in Paris. It includes the figure on the right which shows the surface temperature through the Holocene, the instrumental record, and future projections. 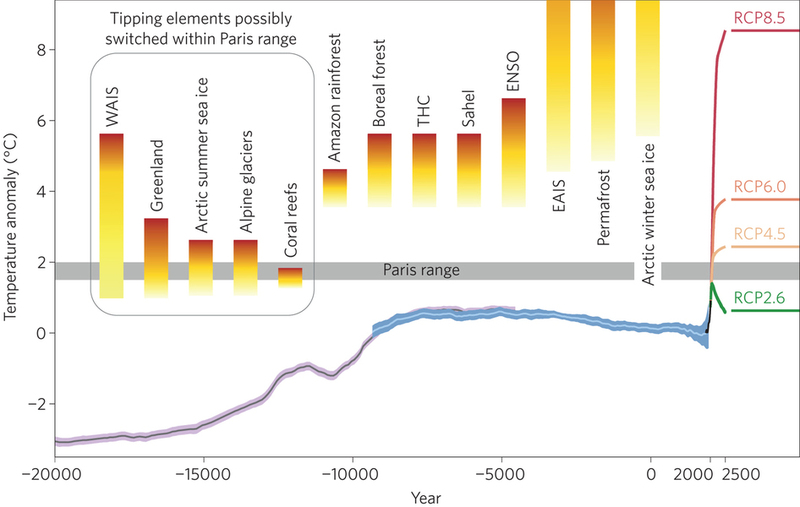 The grey band is the Paris range, and the colored bars show various tipping points (defined as major subsystems of the climate being destabilised). What this shows is that if we exceed the Paris target, then coral reefs will almost certainly pass a tipping point, and Arctic summer sea ice, Alpine glaciers, the West Antarctic Ice Sheet, and Greenland may also be destabilised. Other tipping points will probably only be triggered if we fail to keep warming below 4oC, but that is roughly where we’re heading with current commitments. So, even though deciding on a target is clearly a political decision, there can still be justifications for choosing certain targets. The Paris target will at least give us a chance of not destabilising a major climate subsystem. Something to bear in mind, though, is that the carbon budgets associated with these temperature targets only give us a 66% (or, sometimes, 50%) chance of achieving this target. Even if we do reduce emissions in line with the Paris target, we may still not achieve the target. Similarly, our current commitments are in line with keeping warming below about 3.5oC, but even if we do follow this pathway we may still not keep warming below 3.5oC. One might argue that we should really be doing more, rather than less. Given this, maybe one way to frame proposals for a Red Team exercise is to insist that those who support this, acknowledge that delaying action could significantly increase the chance of passing a number of these tipping points. Anyway, to finish this post I’ll simply highlight that there is another paper suggesting that observationally based climate sensitivity estimates are biased low. I’ve also added a video below, by Stefan Rahmstorf, that discusses the figure I’ve put in this post. This entry was posted in Climate change, Climate sensitivity, Global warming, IPCC, Policy, Politics, Science and tagged 1.5C target, 2C target, Climate sensitivity, Coral reefs, Paris agreement, Temperature targets, Tipping points. Bookmark the permalink. The paper on climate sensitivity has wide exposure in the science media and some penetration into the MSM. The Bloomberg effort tries for ‘balance’ by quoting Nic Lewis in defence of observational estimates. Rather odd, given that his own work doesn’t rule out and ECS of 3oC. Have a question: let’s say we were to stabilize temperature at the 2 degree increase level, what would the CO2 and/or CO2e number be in atmosphere to create stability at 2 degrees? That’s an interesting question. Stabilising temperatures (on average, at least) would require getting emissions to roughly zero. See this post and, in particular, the links. When we do get emissions to zero, global temperatures would stabilise but atmospheric CO2 would drop (sea level would continue to rise and although global average temperature would stabilise, there would be some hemispheric warming/cooling – NH would cool, SH would warm). If you look at paper (Figure 1) then staying below 2oC would probably require getting emissions to zero before atmospheric CO2 exceeded 550 ppm. If we did then get emissions to zero, then atmospheric CO2 would drop (over the next few hundreds years) to something between 350ppm and 400ppm, and then take thousands of years to get back to pre-industrial levels. And unresponsive to the paper. The point of which is that observation-only estimates, even the better-quality ones, omit the effect of slow climate responses. The paper explains why the numbers he quotes are likely to be not just underestimating the ECS but omitting significant additional factors. Judging by the Eemian interglacial and the worst case estimates from the recent paper, between 320-350ppm ?! The point of which is that observation-only estimates, even the better-quality ones, omit the effect of slow climate responses. I think Nic’s response to this would be something along the lines of there being no evidence for non-linear feedbacks and models aren’t reliable. The long-term concentration, yes probably something like this (although I would expected a little higher, maybe?). Not having a target is also political; egregiously so. Indeed, a bit like deciding not to advocate itself being a form of advocacy. When Trump makes bogus claims like ‘global warming is a Chinese hoax’, people call him out on it and rightfully so. Yet I don’t see many people calling Hawking out on his bogus claim. And hawking has a lot more influence on the public perception of science. I don’t see people in the media debunking this, or climate scientists lining up to contact the media to let them know the claim was wrong. Neither ATTP nor realclimate (or other blogs) have decided that it’s important enough to call Hawking out in order to prevent the public from being misinformed about climate change. Business strategy 101 suggests that an ideal target should be achievable, but hard. Too easy and no motivation to make effort to achieve it. If its not achievable, people give up. From a scientific point of view I believe the only reasonable target is 0 warming, as any warming has known and unknown dangers. I think it makes sense to make a political decision on what is a reasonable but challenging target with the aim of motivating maximum effort to keep warming as low as possible. Neither ATTP nor realclimate (or other blogs) have decided that it’s important enough to call Hawking out in order to prevent the public from being misinformed about climate change. I think this is called tone trolling. Here’s a tweet I posted 4 days ago. Here is a Climatefeedback article that I’ve also RTd. I had been thinking about writing a post, but I was already writing this one. A number of other people have been criticising it on Twitter. Stoat has done a post. @ ATTP – Okay, I apologize. I’m just a little upset about how far alarmist misinformation has spread and how it’s been reported on by the mainstream media. Can we both agree that denialism and alarmism are both problems? With respect to this thread’s topic, to me it seems a bit crazy that one can determine the temperature target of the planet while taking into account ZERO economic information. Surely the economic costs of mitigation should be taken into account when making such important decisions. I don’t think they’re symmetrical, though. We have Hawking (in this case) on one side and the entire US administration on the other. With respect to this thread’s topic, to me it seems a bit crazy that one can determine the temperature target of the planet while taking into account ZERO economic information. I didn’t say that we should. I’m simply pointing out that there are justifications for these targets; it’s not entirely political. Of course there are economic implications to trying to achieve whatever target might be set, but I don’t think there’s anything wrong with people deciding that saving the Great Barrier Reef (for example) is their priority. CO2 levels in the Eemain only reached 280ppm. The main cause of warming was summer insolation in the Arctic which was 30W/m2 higher than now. I don’t think Izen was suggesting that the Eemian reached 320-350ppm. I think he was extrapolating from the Eemian. True, but I think you’d expect something between 10 and 20ppm per oC, so 350ppm seems a bit too high. I also think CO2 was slightly higher during the Eemian than it’s been during the Holocene. My 320-350ppm figure was a guesstimate, intentionally pessimistic, to make the point that it may be LOWER than present levels. As you point out the Eemian was probably nearly 2C higher just with a shift poleward of peak insolation. CO2 followed temperature to ~300ppm. I think you make a case for my estimate to be insufficiently pessimistic. Eemian insolation melted out the ice and changed the polar albedo. It looks unlikely that Arctic ice or a lot of that high albedo protection will survive the rapid shift we have already caused. With polar albedo reduced the Eemian indicates 2C can be stable at even lower CO2 levels. Making achieving a sub-2C rise even more challenging. Eminent scientists from other fields get to pontificate on the issues of the day, and because of their eminence the MSM may report it. So Lovelock dismisses AGW as a minor effect, Hawkings describes it as potentially apocalyptic. I suspect Hawkings’ pronouncement will not be adopted by most who advocate for AGW action as a definitive statement of risk. Unlike Lovelock who seems to have been granted a good deal of legitimacy be those sneaking to avoid or delay action. Some media have pushed back against Hawking. A quick Google shows me that Hawking’s comments in question didn’t show up at CBS, ABC, NBC, Washington Post, NYTimes, Does show up at Newsweek. Seems to have gotten a lot more play in the British media. Can you link to this widespread reporting in the “mainstream media?” Or were you not referring to Hawking’s Venus comments in particular? Personally, I find the simple approach works for me. Decarbonize the global energy economy by replacing coal, oil and gas with solar, wind, hydroelectricity, energy efficiency and maybe nuclear, geothermal, and tidal power? Re. media focus on comments by Lovelock, Hawking, Giaever, Happer, Dyson, etc. If only there were active mid-career or senior scientists specializing in the study of climate who could speak to the public and the media about climate change. But I suppose that’s an impossible dream. Using an ECS of 3C and CO2 forcing of 5.35 x ln[CO2/278] from NOAA’s AGGI site, I get 395 ppm for 1.5C and 443 ppm for 2C targets. Allowing for a 20% contribution from non-CO2 GHG drops the targets to 367 and 400 ppm. Of course a range of targets are possible by varying ECS or allowing for ESS. Yes, I think that is probably reasonable. If we think that the TCR is about 2C, then that means we’ll have 2C of warming when we’ve doubled atmospheric CO2. If we then stop emitting, then we’d expect about 25% of our emissions to remain in the atmosphere for millenia. If the natural sinks took up 50% of our emissions, then that would mean we’d emitted about 560ppm, so about 140ppm would stay in the atmosphere for millenia and we’d be committed (for a long time, at least) to an atmospheric concentration of at least ~400ppm and global warming of about 2oC. Does it make sense to discuss the warming in terms of CO2e rather than CO2? The real global warming that we are now experiencing and will continue to experience for the rest of our lifetimes is driven by the impact of CO2e, not CO2, right? I don’t quite get how the CO2 (or CO2e) would drop significantly or quickly if we were to reach net zero emissions, but I trust the folks who talk about that happening. There are a lot of secondary considerations, such as loss of aerosol cooling with a precipitous drop in emissions, etc. but since there is no reason to believe that our species could actually pull off a precipitous drop in emissions, those concerns are largely academic. I think the bottom line on these calcs and this discussion is that we have already ordered up our two degrees of warming with the current level of GHG accumulation. The heat is in the mail, it’s coming. Am I missing something significant about our actual situation? Since CO2e is based on the calculated weighted 100-year warming effect of non-CO2 GHGs relative to CO2, I’d say it makes perfect sense to do so in the short (years) and medium (decades) term. And if we don’t address short and medium-term solutions we’ll never address long-term ones. Some IAMs do this via their damage function. That’s Canada’s state broadcaster, the CBC, uncritically reporting that the ‘world’s most recognized living scientist’ is telling us that the world will end if we warm 1 more degree. So what? Compared to absolute crap spewed out by contrarians, it’s a fart in a hurricane. Quoting a source in his own words is surely an inexcusable misrepresentation of the source. CBC editors should know better than to let their sources get away with that. You should write a polite, but forcefully-worded, letter to the editors, -1. The issue is that it’s given without any context, specifically that Hawking’s claims are well outside the mainstream scientific position. I think the point being made is that he said it, and – unfortunately – it is newsworthy. I would be very pleased if the media did a much better job, than they currently do, of providing a suitable context, but they generally don’t.